AMROTEC X-1000 — C&A Associates, Inc.
X-1000 is designed for large volume cash processing upto 72,000 bills per hour error-free while optimizing cash processing efficiency at financial, casinos and super-markets. Featuring sophisticated Dual-Sensors image processing technology, it provides various counting and sorting mode of operation uninterrupted with a dedicated full reject pocket while at the same time,proivides superb suspect detection. Since it’s released in 2014, X-1000 gained popularity for it’s low bill jam rate, precise and accurate authentication. X-1000 also provides users with superior operating experience and simplicity. Preciously and accurately analyze various security features on each and every passing banknotes to determine and detect even the most sophisticated counterfeits with low fasle alarm rate. Complete bill-path access from front and top cover for easy and quic jam bill removal facilitate unique user-experience. Shortest bill path of 405mm among many comparable heavyduty machines and with corresponding 17 roller-shaft, brake and Clutch allows smooth bill feeding and error-free bill transport to stacker or reject pocket neatly & in organized manner. First of it’s kind, X-1000 provides users option to choose from Relaxed version or Strict version USD software as to bill suspect detection and bill read rate. X-1000 allows users to remove unnecessary counting mode for simplicity. 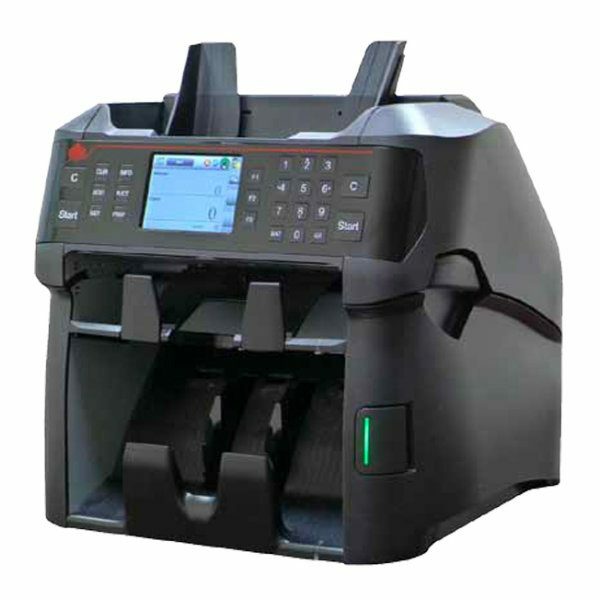 Unique Dual-user feature allows 2 tellers to share a single machine with single printer while keeping each user’s settings.